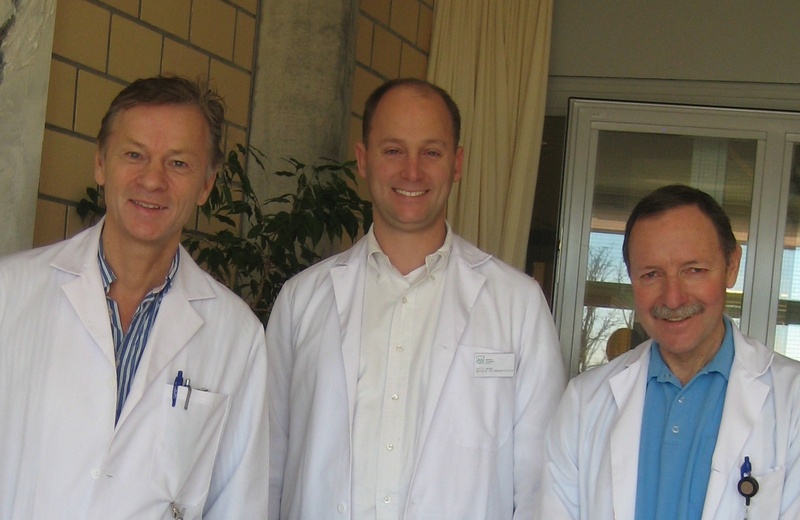 Hand- and Neurosurgeons from Sweden, Switzerland and United States met this past week at the Swiss Paraplegic Centre to discuss the topic “Merging nerve and tendon transfer concepts to optimize functional outcome of surgical reconstructions in spinal cord, plexus brachialis and peripheral nerve injuries" (Drs. Fridén, Brown and Grossmann on photo to the left). The expert group defined the desired goal of restoration of hand function in tetraplegia i.e., reach out of arm, position hand, open hand, come around an object, grip object, control balance, move object, release object – all tasks with least amount of effort. They also identified and defined typical injury patterns (losses) for 5 different injuries for each of the three injury levels and decided to outline current views of optimal strategies to restore function. Multiple crossroads, where nerve and tendon transfers are possible, were described and the expert group presented "best practice" based on experiences and data from the different techniques. Exchange of ideas and future directions for development were outlined. It was agreed upon major future efforts to develop the multi-disciplinary field.